As mobile phones get more sophisticated, is a PIN or password sufficient to keep them from prying eyes? Help is at hand or, more specifically, on your fingertips. Singer Charlotte Church suffered an indignity when saucy pictures of her were distributed from her boyfriend's mislaid phone. It could have happened to anyone. Leave your phone or PDA in a pub and the chances are you've lost more than a few numbers. If you've got some of the latest functions, there could be private pictures, e-mails, work documents and favourite internet sites, all in the hands of a thief. All the thief has to do is unlock it, which is usually straightforward, or crack the PIN. But consumers should soon be able to fight back with a new weapon - their fingerprints. Biometric technology is already well known for its controversial use on the UK's proposed new identity cards. 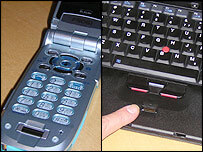 But the integration of fingerprint sensors on to mobile phones, laptops and PCs is still relatively new. Several companies are racing to have their fingerprint security devices adopted for the potentially lucrative phone market. 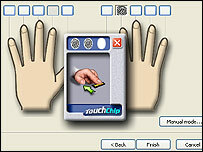 Users would typically have to roll their index finger over a small sensor to register their prints. It needs several correct readings to register the user. Then every time they want to log on, or unlock the device, they roll their finger over it again and, Open Sesame, they're in. It informs users if it hasn't read their prints properly, with instructions like "too fast". Put a different finger on and access is denied, because every fingerprint, even on the same person, is different. The sensor also doubles as a mouse or a navigation tool for web browsing, gaming and menu scrolling. "There are more and more cases of computers being stolen with critical data," says Alan Kramer of UPEK, one of the companies developing the technology. "The growth in technological gadgets people carry, and with more and more important data, means the need to secure that data increases." Thieves are much easier able to access a device via a password than a fingerprint, he says, and this layer of security can be additionally used to protect the hard drive or any other applications. For PCs in the workplace, this eliminates the need to remember and then change a password every few weeks. It doesn't spell the end for passwords but it's another layer of security. And it can also combat identity theft, says Mr Kramer. "With everything going virtual, security based on a few numbers is scary. The fact you can get into an account and empty it based on a code - that's one of the biggest drivers for this. "Only biometrics give a unique link to a human being. Whether the technology is based on password or code, none of that gives you proof of who it is." There are also moves to combat the possibility of someone stealing another's fingerprints, with companies like Senselect developing a biometric PIN, which entails using a number of digits in sequence. Fingerprint security adds about £30 to the cost of a laptop, but that is predicted to fall. Hi-tech mobiles in Japan are using it although most phone operators are yet to embrace it. The mobile market will pick up, Mr Kramer says, when m-commerce takes off. He also sees potential in using fingerprints to restrict adult content or gambling sites to under-18s. Members of the US military use their fingerprints to access bases in Korea and Germany, and police in Malaysia carry PDAs with fingerprint scanners to check driving licences. And doors and safes are opened using prints. Mr Kramer believes far more radical uses are on the way, such as replacing signatures in paying for goods in stores, and use as a universal "key" to open your front door and car. He acknowledges there is a Big Brother fear about biometrics but says fingerprint data is self-contained on the device and not stored elsewhere. Other firms such as AuthenTec, which says it has sensors in more than three million mobile phones worldwide, and DigitalPersona, also sense this is about to take off. "A mobile phone isn't just used as a mobile anymore," says Phil Robinson, chief technology officer for security firm IRM. "People are carrying around portable computers in their pockets that have an added functionality of being mobiles. Therefore it's a natural progression for these to be used as attack vectors." He says fingerprint access would probably deter the casual thief because it's another layer of security to crack. But criminals will still have the final word. "It would add another obstacle, but I'm not wholly convinced it would be the complete answer to security. There's always ways and means." The debate is now closed. Thanks for your comments. I used Microsoft's fingerprint reader which is integrated into my keyboard. It is a fantastic piece of software which is highly secure and easy to use. Biometrics should be used instead of a PIN as it is much more secure. You could think like John Airey from Peterborough and think we will get our finger cut off, but does this mean people will put a gun to our heads to get a PIN? I think not. How easy is it to steal a fingerprint? We leave fingerprints everywhere - including on the item that we would be trying to protect. It would be one more thing to be cautious and worry about. I have a fingerprint reader on my PDA. Don't ever think of doing the gardening or working with sharp knives. Cleaning things with bleach also seems to mess up the fingerprints recognition for a while. People will find simple ways to bypass or foil the most elaborate security devices. I remember Doctor Who once entered a high-security dalek vault using only a hairpin! I have been using it on a PC for about a year and it is great. On anything that needs a password I can fill in the details, tell the security program to remember it and from then on only have to swipe my finger to get access to anything. Much easier and more secure than PINs and passwords and obviously you would have originally scanned multiple fingers in case of injury. The worry is, as John says, the possibility of losing a finger to a really insistent thief, but every system has its flaws. Security is always about trying to stay one step ahead of the criminal and raising the barriers. Biometric analysis is another way to raise the complexity for theft/fruad. This technology is not a security panacea, but I no solution in isolation is. To prevent fingers being cut off you should have in place a process called two-factor authentication. So use a fingerprint and a PIN. Fingerprint readers (or biometric readers) are the best if you want to keep things safe. It only takes a second for the fingerprint reader to read your print and it does the rest for you when saving passwords to docs / websites / logging into windows. Been using one for six months now on my PC and have not looked back. Great idea, the sooner it happens the better. Should help deter the would be criminals if they can't use the thing they steal. Fingerprints are trivially easy to forge, using only household items. And what happens when a person loses their fingers in an accident? Fingerprints are just about the worst method for securing your data. Fingerprint it all! Bring in ID cards - whats the problem? For those individuals and privacy freaks - wake up! How can it be said that introducing such technologies and ID cards will threaten ones anonymity when ones anonymity is an illusion anyway. When you go to the supermarket credit card details are taken, when you use the ATM your details are held as well as tracking where you have been. Fingerprint ID for phones is a really bad idea. The Register reported here on a case where the owner of a car that had fingerprint recognition had his finger cut off in order to steal the car.